Very windy conditions with only a light shower towards the end of the B and A grade races. In D grade, Chris Bagot strung out the field. Several wins in a row see a visit to C grade. Peter McLean took the win in C Grade. A grade saw a split between A+ and A- with Stefan Mic winning the sprint. As is often the case in cycling, the strongest rider is rarely the winner. Bad luck, collusion or a moment of mental weakness could each prevent the strongest rider from taking the top step on the podium. When all three of these factors combine against you, you’re in for a tough day. 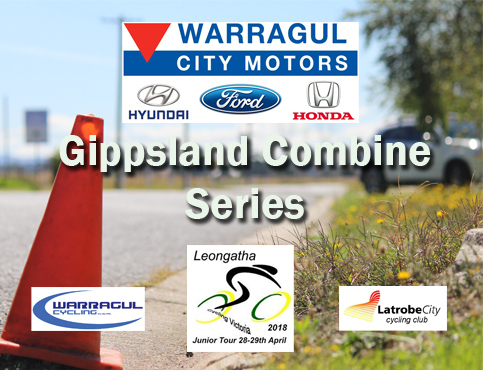 And so it was on Sunday morning in Yinnar for round 3 of the Warragul City Motors Gippsland combine series. With Jayman Prestidge seemingly on call to catch a runaway trampoline, the B grade field was reduced to 7 riders, all very even on paper, but each with known strengths and weaknesses. Two pure climbers in Roland and Stott (AKA twister wrappers on this flat windy Hazelwood pondage circuit), two strong men in Yeatman and Aitken (can ride all day, but can’t sprint*), two renown sprinters in Monk and GT (renown for sitting at the back of the bunch and doing bugger all), leaving the complete cyclist Marriott (completely useless at sprinting, climbing and time trialling) to probably either win or come last. Not long after the drop of the flag, Marriott took the ascendancy and used a favourable tail breeze to distance himself from the bunch. The bunch seemed happy to let him go, and combined with some members missing the first turn, Marriott stayed off the front for all of lap one. With “a man up the road” Monk and GT took this as an opportunity to sit on and let the others chase (or at least used it as a good excuse). Once caught, Marriott contributed nothing to rolling turns, saving himself for another attack on the back hill. Despite his best efforts, Marriott was however quickly chased down by Stott and Aitken. As the bunched turned into the gale like headwind, Yeatman saw this as his chance to sneak off the front. Marriott was quick to jump across, but the pair were promptly chased down by Aitken and Stott who weren’t letting anything get away. The bunch stayed together for the rest of lap 2, with Aitken and Stott both prominent and GT rolling the occasion soft turn. Marriott was giving them nothing, instead saving himself for a fully-fledged attack on the back hill. And attack he did, successfully shelling first Yeatman and then Roland. Seeing that Roland and Yeatman were off the back Marriott got on the front and contributed to the turns for the only time in the race, so as to ensure the dropped pair did not chase back on. As the remaining five approached the finish of lap 4, GT and Aitken rolled off the front to create a sizable gap on the chasing three of Monk, Stott and Marriott. Being from Leongatha and left alone with two Warragul riders, must have been concerning for Stott. Or at least it should have been, as the two Warragul riders were about to do him over. Both Monk and Marriott let Stott do the bulk of the chasing before Marriott attacked and successfully bridged across to Aitken and GT. With Two Warragul riders now in the break, Monk could have just sat on Stott, but instead thought it would be great if Warragul filled all 3 steps of the podium. Monk thus attacked Stott. Monk’s mission to bridge across would have been assisted if his team mates up the road had looked around and observed that he was successfully bridging solo. In this instance the cycling gods were smiling on Monk, as GT got a flat tyre. Now came the decisive moment of the race. Marriott could easily have kept rolling turns with Aitken with a view to use Aitken’s strength to stay away and then roll him at the finish. The “selfless” Marriott however elected to sit up and wait for Monk who was now pedaling in squares in pursuit. With Aitken now up the road, Marriott and Monk worked together to bring the gap back. Although Aitken, a much the stronger rider than either Marriott or Monk, with 2 against 1 and especially in these conditions, the two made light work of the gap and all three rounded the corner together into the gale towards the finish. Now Aitken found himself in the uneasy position of being the only Latrobe rider surrounded by two Warragul cyclists. Initially Aitken was clever, saving his energy and contributing nothing. This tactic however was questioned by Monk noting that the chasing party of Yeatman, Stott and Roland were back in sight and gaining ground. Words from Monk to the effect of “you can help and guarantee 3rd or you can sit on and let them catch us” were enough to get inside Aitken’s head and reluctantly he went to the front. Marriott and Monk’s collusion was paying dividends as they proceeded to sit on Aitken as he drove it into the wind approaching the finishing straight. Like observing a steak cooking on the BBQ, Marriott adjudged Aitken as being suitably “well done” and attacked with more than a kilometer to go. Monk continued to sit on Aitken as the pair slowed to a snail pace, such that they were caught by Yeatman his crew with less than 500 m to go. Despite several concerned looks over his shoulder, Marriott was able to hang on for his first victory in years, with Monk 2nd and remarkably Yeatman 3rd. 1-2-3 Warragul and the strongest rider of the day Aitken in 6th and out of the points. Cycling is indeed a cruel sport. Race four of the series is a scratch race hosted by Warragul at Shady Creek. Details here. This was race 3 of a 24 race (best of 15) Gippsland Combine Series presented by Warragul City Motors.